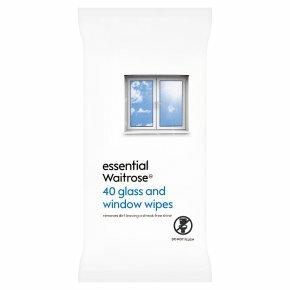 Essential Waitrose glass and window wipes provide a convenient way to lift off dirt leaving surfaces streak-free. INGREDIENTS: aqua, Isopropyl Alcohol, Propylene Glycol Butyl Ether, Surfac MGME (1-methoxypropanol, Methoxyisopropanol), Acetic Acid (aqua, Acetic Acid), Acticide MBS (aqua, Methylisothiazolinone, Benzisothiazolinone), Crodasinic LS30 (aqua, Sodium Lauroyl Sarcosinate), Citric Acid. If medical advice is needed, have product container or label at hand. Keep out of reach of children. Keep away from heat, hot surfaces, sparks, open flames and other ignition sources. No smoking. Read label before use. Wash hands thoroughly after handling. IF IN EYES: Rinse cautiously with water for several minutes. Remove contact lenses, if present and easy to do. Continue rinsing. If eye irritation persists: Get medical advice/attention. Do not dispose of wipes in the toilet.